en-suite, cloakroom or utility room. and double #8 in the SW.
the northeast part of a room in November. or you run a business from home. be treachery in November, just be careful and read all the small print. cure is placing a statue of a red Buddha in the centre. and enhancers of how you can enhance your month and year even further. It is not too late to place the annual cures and enhancers. it is double #4 this is very auspicious for romance, study and career. 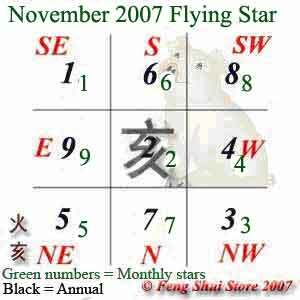 can place a pair of Mandarin ducks or double hearts in the west this month. and/or a real piece of quartz crystal. pursuits or literary challenges to use this palace frequently. in the southwest corner of the bedroom. may also be a possibility when under this romantic influence of the month. your bedroom is in this corner of the house, place something blue, e.g. quartz double hearts here to remind you of this romantic influence. west this month to enhance romance. for studies as it promotes academic achievement and is good for examinations. trend in the month of November. globe on their work desk. East – A mix of good and bad here. promotions and if you have a door or office in the east expect good news. South -A mix of good and bad again. knives or scissors are in their bedroom. six rod metal wind chime is very effective here. area or anything triangular or square in shape. main door is located here. a row with red ribbon. it is better to be cautious. every few days though especially if you live in a warm and dusty climate. less important room you do not need to do anything and do not read further. should check back each month.